Why Dry Ice Puts Smoke Machines in the Shade ? We all like to rumba on the dance floor when there are some cool special effects at play. Laser lighting at the disco, strobe effects and storm effects, are all stimulants on the dance floor. When a crowd sees some smoke or cloud like wisps of ethereal magic, it inspires them to get up and dance. Similarly, performances on stage are enhanced by special effects. The audience is spell bound by the perceived trickery or possibly supernatural magic. When it comes to these fog producing special effects it is dry ice that puts smoke machines in the shade. Why is that? Most smoke machines employ a glycol mixture, which is heated to create a fog, and this can irritate the airways in some people. The glycol mix can, also, leave an oily residue in some cases. The smoke machine, often, triggers fire alarms from smoke sensors in venues. 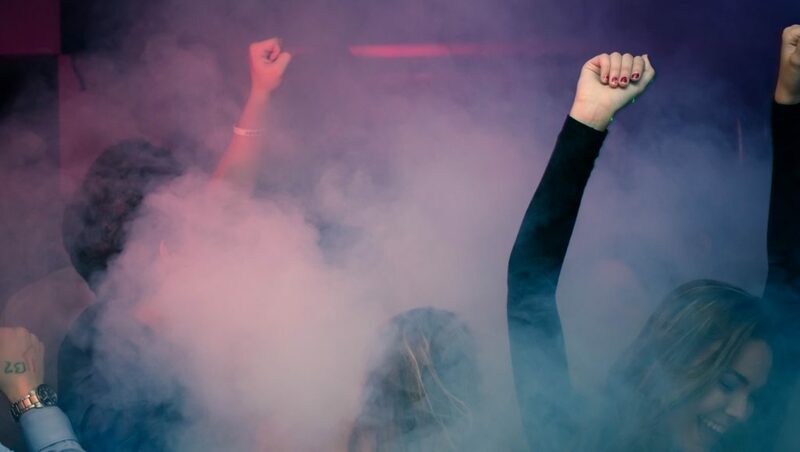 Smoke machines are not the healthiest technology for producing special effects at parties, performances and functions. Recently, I attended a theatrical performance at my daughter’s high school auditorium, where they employed a smoke machine. The effect was suitably eerie, but soon members of the audience were coughing and I could feel my own eyes water after a while. Dry ice machines, on the other hand, only use heated water and dry ice to create fog. The dry ice is a solid carbon dioxide and does not leave any traces. It always sinks to the floor, whereas smoke rises. The machine keeps heating the water to maintain the effect. The superior nature of dry ice means that the vaporised carbon dioxide remains low to the ground and away from respiratory pathways. You do need to use protective gloves when handling dry ice, because it so cold that it could cause frostbite in the handler. It is always safer have good ventilation in any venue where you are employing special effects like these. The dry ice machines for hire our specially designed to produce consistent and safe fog like special effects. They are maintained and serviced to ensure that they are functioning appropriately for your safety and the safety of others. Usually, the hiring of these devices is accompanied by an operator to ensure that there are no accidents or inappropriate handling. Dry ice machines may be a little more expensive to hire than smoke machines, but you will avoid the coughing and sneezing, and the wail of the fire alarm. Good times can be had with a dry ice machine near the dance floor to create ethereal clouds to moon walk upon. We all need a little theatre in our lives, every now and then, to put some magic back into things. Playing at dance in a spacey environment can reinvoke Major Tom, or it might be Kate Bush on the moors in the mist, with some Wuthering Heights. Whatever your fantasy is, it is good for the heart and soul to lark about sometimes. Brides and grooms get to have that first dance of their married lives in a heavenly setting, surrounded by their loved ones looking on. The moon beams are alight in the magically ethereal realm for a moment or two. Fairy tales come alive and the princess and prince walk abroad in the night air. Michael Jackson may have passed on and that single white glove may not be raised in salute over the dance floor, but we can always pretend, can’t we? Dry Ice Machine Hire Sydney salutes the magic in us all.